The DV modes for HF included a hardware modem from AOR and a software/sound card system called WinDRM (which evolved to today's FreeDV). The VHF/UHF modes in use then were D-STAR and P-25. 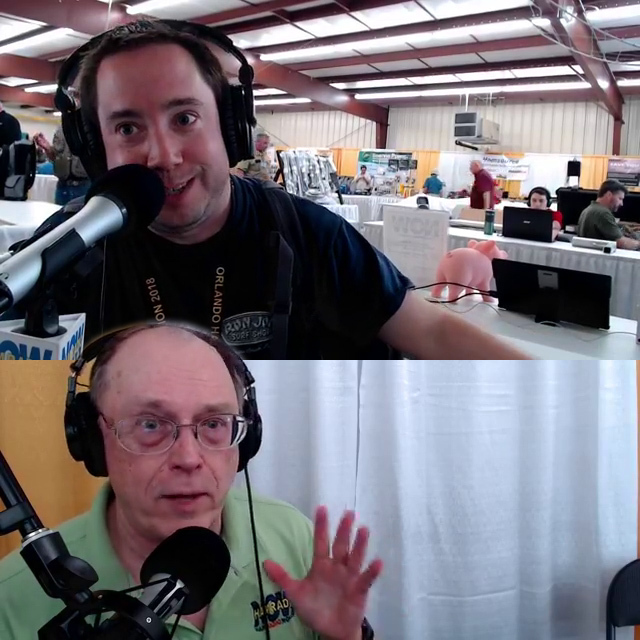 In this episode we review what's been going on with the ARRL, from the Code of Conduct to the proposed revisions to the Bylaws and Articles of Association. We look at a new group that's formed to protest some of the ARRL Board's actions. And mostly we read some detailed responses to inquiries that Gary and others sent to some of the Directors. They're not coming on the shows yet, but they are being more responsive than we saw initially (though, as Roanoke Division Director Dr. Jim Boehner N2ZZ noted, those responses won't satisfy many critics). At the end of the show, you'll see a note about what we've been calling The Best Part of the Show™. That's the banter that comes after we 'formally' close the show (and say Over and Out), that may or may not be related to the main topics of the show. We're not fooling our guests into thinking they're having a private conversation. Facebook LIVE is still running, as is the recording hard drive. But it still gets a little looser than our usual taut, tightly formatted interview segment. And if you're not asking "What show is he talking about?" at this point, you haven't been paying much attention. But it really does get looser. Anyway, we cut that off the YouTube version of the show this time. OK, it's still a 90 minute show. We're still not fooling anybody. But maybe it'll scare a few less people away. The full show is in the audio version, and on the Facebook LIVE recording session, if you want it. Radio Rating: A+. As usual, a few web sites, but we don't even put the text we're reading on the screen (Gary didn't have time to format it). [The 'Radio Rating' does not measure the quality of the program content. It's our guess as to good a radio show it is, without video].